The apple juice, cinnamon stick, cloves and ginger on their own make a delicious winter punch when gently warmed together. Pour the apple juice into a medium-sized saucepan that will fit six pears lying down in a snug layer. Add the cinnamon stick and cloves. Peel and slice the ginger, if using, and add that too. Peel the pears, leaving the stalks intact. Submerge them lying down in the liquid. Bring to a simmer and cook the pears for about 15 minutes, until the tip of a sharp knife pierces through them easily. 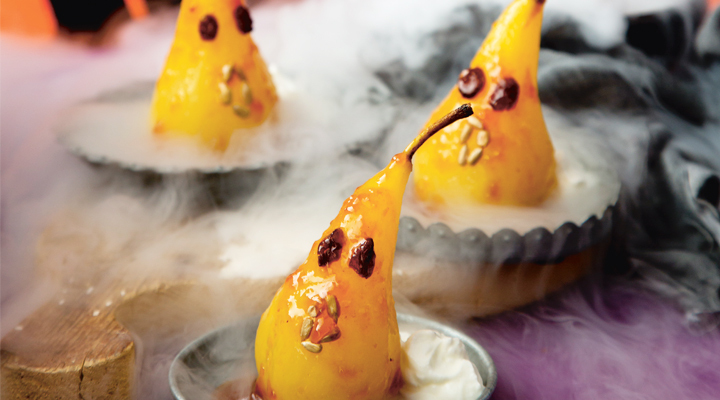 Use a slotted spoon to carefully remove the pears and set aside. Increase the heat to high and add the honey. Boil the liquid for 20 to 25 minutes, until reduced and syrupy enough to coat the back of a spoon. If not serving straight away, then cook for about 5 minutes less, as the juices will thicken further upon cooling. Meanwhile, cut a small slice from the bottom of each pear and arrange each one sitting upright on its flat surface on a serving plate. Cut the raisins in half and press two halves onto each pear as eyes. Stick sunflower seeds underneath in the shape of a round open mouth. Once ready, spoon the reduced apple syrup over and serve with a dollop of Greek yogurt. These will keep covered in the fridge for a few days.